"@mitchellvii: Face it, Trey Gowdy failed miserably on Benghazi. He allowed it to drag out and in the end, let Hillary get away with murder. It’s like they’re all sitting in the fetal position in the corner of their rooms listening to a mix tape of The Cranberries, Bonnie Raitt, and Rihanna while they cycle through the appropriate steps of an emotional breakdown. Aaaaaaaand that’s apparently where we are right now.
.@realDonaldTrump @USARestoring @HillaryClinton @TGowdySC Not just yea, but, H*** Yea! Can see REP Gowdy as our best AG in decades! @realDonaldTrump @USARestoring @HillaryClinton @TGowdySC love Gowdy he is tough and honest man. You know that friend I mentioned? The one who forces you to put down the Cherry Garcia and shower, then tells you that the man of your dreams was never good enough for you in the first place? It’s not him, it’s you. Trey Gowdy – one of the most conservative and fierce politicians – has endorsed Marco Rubio, one of the most conservative men to run for president in a very, very long time. They go together like peanut butter and jelly, mashed potatoes and meatloaf, wine and family gatherings, etc., etc., etc…. Now, Trey Gowdy, Mia Love, and Tim Scott all rank above 80% on their Heritage Action Scorecard, when the average House Republican has a ranking of 63%, and the average Senate Republican has a ranking of 59%. And what was it that Reagan said? It is also worth noting that the Heritage Action scoring system is incredibly stringent, as RedState notes here. My point is this – Do we all remember Jim Demint at all? The guy who basically started the revolt against Sen. Mitch McConnell (R-KY) 47% and business-as-usual in DC by singlehandedly calling attention to some of the first challengers who stunned incumbent/establishment candidates? When Demint left the Senate, he went to Heritage Action for America and one of the projects he set up there was a new rating system for members of Congress that would expose the fraud of the American Conservative Union’s ratings (which Republican members of the Senate had long ago figured out how to game without angering their moderate constituents or hurting their position at the feeding trough). For example: Mia Love and Trey Gowdy are both docked for supporting Trade Promotional Authority, but I’m a conservative and I support TPA, George W. Bush used his support for TPA as part of his campaign platform, and the same Heritage Foundation docking Mia Love and Trey Gowdy actually supported giving Bush TPA (Time to Give President Bush Trade Promotion Authority). Now, I understand that it’s a different president, and everyone has their double standards, but it’s worth noting that their position on this shouldn’t even be close to a game changer, because many conservatives are in agreement with them. That’s the problem with today’s conservative movement, we rely on rankings, scores, and media bites to tell us who we’re supposed to support, and who we’re supposed to hate. A person’s proven character be damned! If someone worshiped by “patriots” far and wide labels the politician with an upstanding character as “GOP establishment,” we’re expected to turn our backs in unison and open our wallets for their current flavor of the day, even if the flavor is a variation of questionable Harry Potter jelly beans. The purist faction of our party is a diseased limb in need of amputation before it kills the entire movement. Marco Rubio has a Heritage score of 94%, which makes him one of the 4th most conservative senators, but that didn’t dictate my choice. My beliefs don’t always align with the Heritage Foundation, the ACU, and most notably as of late, the Tea Party. They don’t always align with Marco Rubio, either. Most importantly, they don’t have to. Immigration, foreign policy, and economy are the three most important issues to me, and on those issues I align with Marco closer than anyone else. It’s that simple. As a bonus, he poses the greatest threat to Hillary Clinton. Darrell Issa and Trey Gowdy have both done their best to expose Barack Obama and Hillary Clinton for the poor choices they were/are. From Fast & Furious to Benghazi, they have both relentlessly sought the truth, and pushed against those who were fiercely protected to expose those who should be held accountable. They have aided in exposing their misdeeds to the nation, and though faced with non-stop attacks for their noble actions, have been steadfast. Issa and Gowdy are partly to thank for the fact that the 2016 election should have been an easy win for Republicans. Their actions to expose the nefarious dealings of the Democrat party changed the way many view their own leaders. However, we have the purists and heretic hunters – the same belligerent masses currently attacking Gowdy and Issa for supporting Rubio – to thank for mucking up the plans and changing our easy breezy path to the White House into something that resembles a torturous journey through the Labyrinth, and the hellish spectacle of David Bowie singing Magic Dance, ending with me begging for a peach from the Goblin King that will remove any memory of Donald Trump. My sincerest “Thank you!” for that, guys. Point being, the vast majority of those people have not a clue about what’s in the bill, why many of the concessions were required, nor the steps Paul Ryan plans to take in the future. They were fed a line by the conservative media, just as those currently opposing Gowdy, Issa, and Love were, and now they’re just letting this baseless rage dictate their lives. I’m in the middle of making my way through the spending bill and will be writing more about Ryan later this week, but I wanted to touch on the same knee-jerk contemptuous responses Ryan is receiving in reply to a simple “Merry Christmas” message. I get angry, too. I get it. Within the last month I have gone after Ted Cruz here, and then embraced the “political cannibal” label here. However, my attacks were well thought out and researched, I went after him for pandering to a man who blatantly supports liberal policies, I went after the character he has so frequently touted, and I stand by those arguments. I am in full support of holding politicians accountable, and supporting those who hold the same beliefs as you, as long as those doing the attacking and supporting are well informed. The Tea Party Leadership Fund sent out a series of emails urging supporters to back the effort to draft Mr. Gowdy as House speaker, and to contribute money to the group. Mr. Gowdy, through a spokeswoman, said he did not authorize the effort and opposed it. 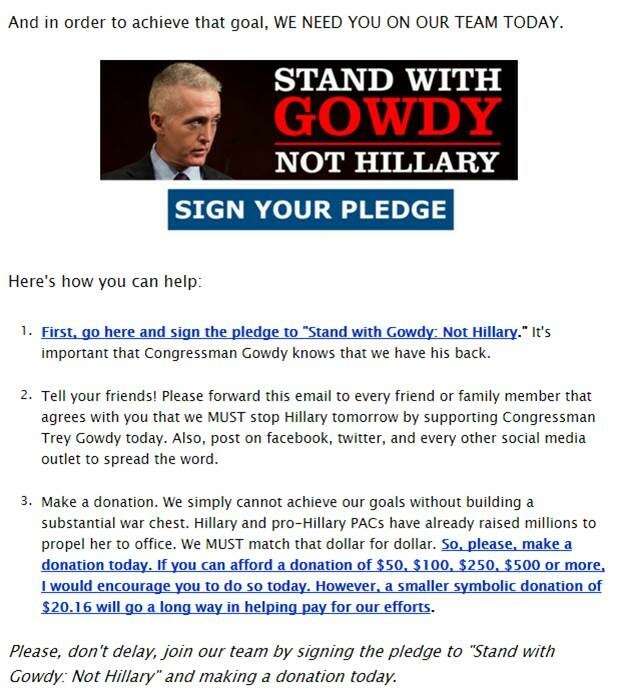 “Congressman Gowdy does not support group’s efforts to raise money by using his name or image without approval. These outside groups use members’ names — not just his — without their knowledge and mislead people to think they support or are connected to a group when they are not,” his spokeswoman said. “When Rep. Mia Love talks, conservatives listen. Now that Mia Love and Trey Gowdy have rejected the “chosen one” candidates of the angry ilks, they’re deemed “bad conservatives.” The disquieted portion of the conservative movement, lapping up negativity from the right-wing media like a starving cat, wait for the release of a new target. They angrily click and donate their funds, hell-bent on proving their patriotic bona fides, only to have their funds line the pockets of the professional beggars while mere pennies get thrown at the conservative candidates they tout. Trey Gowdy received a whopping $2,000, while Pierson Consulting Group (Does that name sound familiar?) received over $31,000. Side note: If you seek to destroy the money hungry masses controlling the group think, look no further than your state Tea Party chapters and their growing email list. I could write an entire blog, or ten, on the money machine “grassroots conservatives” created. In an attempt to break the group think, they just created their own brand of group think. Sadly, it’s working. True blue conservative politicians, who align with the vast majority of our principles, veer off the thin line of conformity that the self-proclaimed gods of conservatism created, they then exploit the minor differences and make you an angry “patriot,” then solicit your funds and use them to line their pockets and make more angry “patriots.” Rinse, wash, repeat. It’s the old “with great power comes great responsibility” rule. We gave them great power, and we gave the conservative media the same, and at first they seemed responsible, but then we came back from vacation and found out they decided to throw a party in our absence. While away, the kids purchased prostitutes, alcohol, crack, and #CruzCrew bumper stickers with our money. They wrecked the house, we found them renaming the conga line the “Trump Train,” Sarah Palin stole the flag bedazzled stiletto pumps from the prostitute, and Michelle Bachmann is in the backyard scaring the neighbors with “It’s the end of the world!” written over an “Uncle Sam Wants You” sign. Breitbart News writers are practicing how their first name sounds with Donald Trump’s last name in Lisa Frank notebooks, Drudge Report is over writing their conspiracies and polls on the walls in crayon, Mark Levin is aimlessly wondering the halls mumbling about WMDs, and Hannity, Malkin, and Ingraham are selling Trump/Cruz campaign popsicles to the kids in exchange for their lunch money. Meanwhile, back in Sanityville, Trey Gowdy, Mia Love, Darrell Issa, and Tim Scott – four staunch and dedicated conservatives – just want to talk about the person they believe is best suited for the presidency. I imagine they’d like to do so without the ambivalently aloof subservient stormtroopers of the far right making their every move an opportunity for baseless attacks, but such is life. Welcome to the new conservatism, hell-bent on removing one moblike party and replacing it with another. Follow the rules, or pay the price. I for one, am proud to say that if the party of Paul Ryan, Marco Rubio, Trey Gowdy, Mia Love, Darrell Issa, and Tim Scott are the party of “RINO Establishment Shills,” then let me know where I can order my “RINO Establishment Shill” embroidered polo and matching wine glasses; God knows, if the current debacle continues I’m going to need the wine glasses. This may be one of your best. It’s a high bar, though. Thank you for that! Really great stuff. This was all so wonderful cofc&s, but as a former elementary schoolgirl I think I loved most the nostalgic imagery of Breitbartians John Nolte et al “practicing how their first name sounds with Donald Trump’s last name in Lisa Frank notebooks”. You know, it’s pretty darn pathetic that people don’t laugh with Breitbart writers as their site’s charismatic & cutting-edge founder Andrew had once envisioned but at them for the unremitting freakishness of the seedy carnival sideshow they’ve become. Can I get ” Rino Establishment Shill ” merchandise in hoodie form? I’m in Colorado, and it’s cold. I would proudly wear it!